Winter Carnival Association Records, 1885-1992. Minutes, scattered correspondence and financial information, administration files, scrapbooks, and printed materials of the voluntary organization which sponsored the Winter Carnival since 1885. The administration files contain financial and membership information, event files (documenting both indoor and outdoor activities), publicity and promotional material, festival schedules, and a variety of printed materials. Photographs, legends, and background information concerning the history of the carnival and its royal court are also included. Also included are files kept by the Midway Club of St. Paul concerning the Club’s Carnival activities; records documenting the establishment, organization, and operation of the annual International 500 Snowmobile Race from Winnipeg to St. Paul; and membership rosters and a scrapbook pertaining to the court’s House of Vulcan are also included. St. Paul Outdoor Sports Carnival Association Records, 1915-1918. Financial records, correspondence, and miscellany of this organization that sponsored winter festivities. They include lists of committees, pageants, participants, and contributors; and printed handbills and circulars. MNHS call number: See finding aid in the library (BO2/.S149). 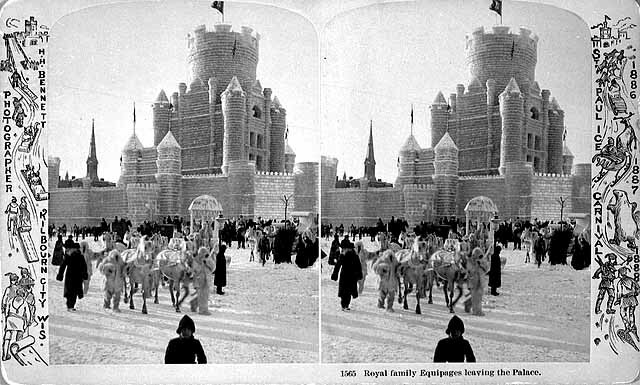 Architectural Drawings of Winter Carnival Ice Palaces, 1887, 1941, 1975. There is a complete set of blueprints of the 1941 ice palace designed by architect Clarence Wigington. A set of blueprints and pencil drawings depict the 1975 Ice Palace on Harriet Island designed by Olsen. 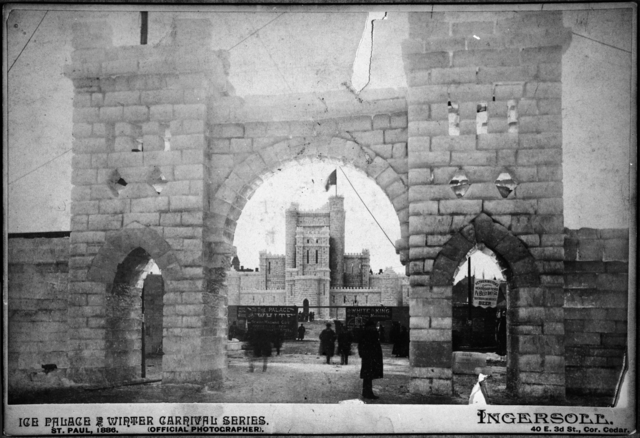 A third set of drawings, done by Olsen for Dayton’s Design Department, are an attempt to redraw accurately the 1887 Ice Palace designed by C. E. Joy. Images, flyers, pamphlets, festival descriptions, and day-to-day set up and take down lists for the Winter Carnival. Programs containing information on the Carnival events from 1959, 1971, 1976, 1977, and 1978. St. Paul, Minn.: St. Paul Winter Carnival Association, 1978-1979. Newsletters on the Carnival presidents and other officials in 1978 and 1979. Minneapolis: Carol Morgan Associates, Inc., 1985. A commemorative calendar for the Winter Carnival centennial, it includes pictures of the 1886 Carnival. Legend, by the Saint Paul Festival and Heritage Foundation. St. Paul: Saint Paul Festival and Heritage Foundation, 1996, 1999, 2000. Making it a Hot One: Outdoor Sports Carnival, St. Paul, January 27th to February 5th, 1916, motion picture. St. Paul: Raths-Seavolt Film Mfg. Co., 1916. NBC Broadcast of 1940 Saint Paul Winter Carnival, soundrecording. Photographed by: Clem Butler. 1938-1939. Ice Harvest on the St. Croix River, motion picture.